Adware programs often need additional applications like Microengine to function properly. This application is categorized as adware helper because it allows a number of adware programs show advertisements on your browser while you surf the Internet. When you remove Microengine from your computer, you have to terminate all the other adware applications that are clearly using it. If you have no idea which programs you must delete along with Microengine, get yourself a reliable antispyware scanner that will scan your system and detect all the potential threats. Then you will just have to remove them automatically. You most probably installed Microengine on your computer accidentally, together with other adware applications. This adware helper comes as a part of many adware programs, so most of the time, users aren’t even aware of the fact that they have this unwanted application on-board. Microengine should work as a browser extension, but it only installs a plug-in on the Internet Explorer, so if you do not check your browser’s extensions that often, you may not even see that something has changed. Also, the adware helper has a running process that is called apponed.exe. This process can be found in the list of running processes via Windows Task Manager. You can also kill the process, but that would not be useful because the application can auto-start whenever you turn on your computer. The official stance of this application is that Microengine is supposed to act like a security software program that protects web browsers from potentially corrupted websites. Needless to say, this is just a cover, devised to trick unsuspecting users into thinking that Microengine is completely harmless. In reality, Microengine blocks your browser’s security systems so that adware applications from the SuperWeb and Multiplug families could display customized commercial advertisements and other types of pop-ups. Computer users must understand that pop-up ads that appear on a random basis on their web browsers cannot be trusted. Clicking any of them could lead to corrupted websites that are involved in online marketing scams and even malware distribution. Adware could be just an annoying nuisance, but if you don’t take care of it, it could result in a serious computer security issue, and then you would be forced to remove a lot more dangerous programs than just Microengine. 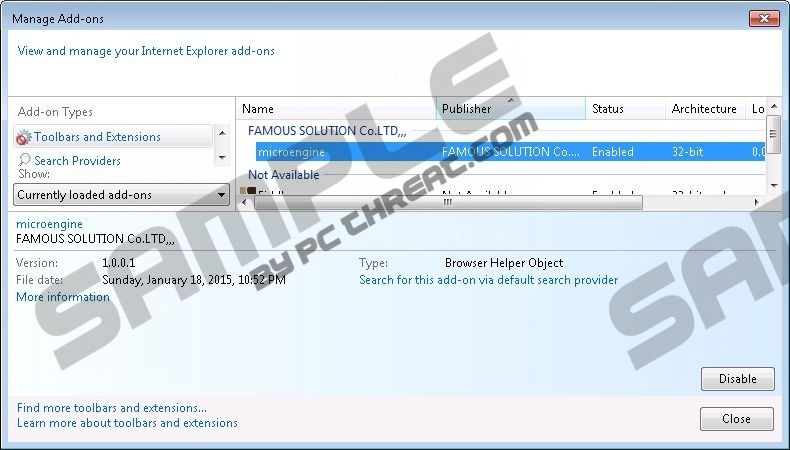 It is possible to uninstall Microengine via Control Panel, but you need to terminate all the other applications that are related to this adware helper. For that purpose, you should scan your system with the SpyHunter free scanner and then delete the unwanted programs manually. If manual removal is out of question, you can delete potential threats with a licensed antispyware tool. Select Uninstall a program and remove Microengine. Go to Uninstall a program and remove Microengine. Open Add or remove programs and uninstall Microengine. Remove Microengine from Toolbars and Extensions. Quick & tested solution for Microengine removal.